Link to #NBCNews #Twitter/#Q hit piece. #Russia continues to be used by #DSMedia & #Minions from the #Swamp. As the news isn’t, they can only be seen for what they are, the #EnemyOfThePeople! #QAnon’s post may remind of us of #Clowns. In Action, pushing news that no longer reports truth: Julian Assange has never been interviewed; #SethRich’s murder has never been solved. Q linked to NASA Countdown 101 which explains countdowns & pauses or built-in “holds” that don’t impact overall sked. Q drop 2676 ref’d “[-30]” re: Mueller probe conclusion. Interesting post by Q. NASA shuttle countdown pauses from time to time to allow for targeting of precise window. Q correlating to the great awakening. Q was silent for a little while to allow for certain tasks to complete without impacting overall schedule. Mueller “BLOCKADE” end is near. Yesterday during hearing Whitaker confirmed Horowitz/Huber investigating CP FISA abuse & other “matters” (U1, HRC emails, CF). He also told former AG Ed Meese on Wed about Huber’s investigation. Correction: Whitaker met w/Meese on 2 Jan (not last Wed). Good catch, @M2Madness! Not sure if intentional & if so, what it implies but there was an 11 Feb 2018 post with her name only & no context. #QAnon suggests we read between the lines (below), because, once the blockade ends, we are good to go. Part 1: Countdown markers over next 90 days? Whitaker temp AAG role was to clean house at DOJ. Remove Mueller blockade (incl RR, Ohr, + 1-4?). 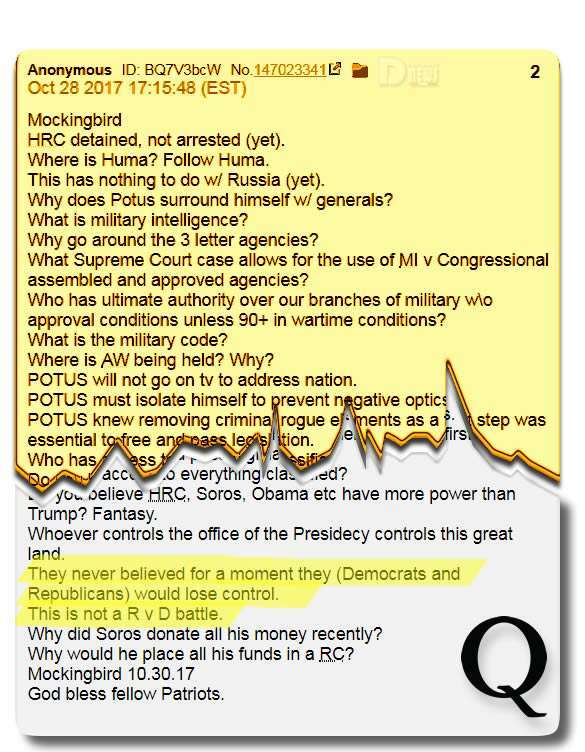 Barr & Whitaker know [RR] excuses to stall DECLAS not legit. Wray capable of making determination re: DECLAS repercussions. Part 2: Barr to DECLAS & give 2nd (redacted) SC scope memo to H Intel Cmte. Barr to meet w/OIG & Huber. OIG rpt complete. Dems will use subpoenas to stall release. NK de-nuke plans/process > lift sanctions & provide aid. UK/AUS to shift narrative away fm FVEY spying on POTUS. Part 3. Dems to push more fake (“Russia”!) news projecting their treasonous activities on POTUS. People catching on & waking up. Wall debate will end on 15 Feb > exposed Dems’ irrational position. Army Corps of Engineers will finish building the wall. “Placeholders active” indicates we will soon see the items outlined on the /patriotsfight/ read-only board unfolding in the news. Lots of “future proves past” incoming! This is #ThePlan. All of the drops & events that have lead us to research & raise the level of understanding of both the overall concept & the reason for the step by step exposure of the facts, so that the sleepers would be exposed slowly, ushering them along, toward the #GreatAwakening. An overview, of #GeoPoliticalChess, is laid out in this drop & presents in a less obtuse, how2 formulae. From temp appointment scenarios to #RR’s removal, #Barr & #Whitaker engaged in the #DECLAS logistics, Whitaker stays, Barr is meeting w/ #Huber & #Horowitz’s crew, further #OIGReports & more. It wraps up w/the expected #Dem reactionary #Panics, positive #NK talks, #UK/#Aus #FVEY’s, & the continued damage control efforts that will be forthcoming from #DSMedia & the #GreaterSwamp. As well, there are efforts, w/in the plan, 2redirect or cease #FakeNews narratives as they surface. All is moving w/military precision, as expected, according to #ThePlan. The #BorderWall talks are close. Complex post by Q. Certainly not the first. Appears Q giving us a timeline of what to expect in next 90 days. However, #qanon also reminding us this timeline can be paused (think nasa shuttle countdown – previous post) to allow events to track with military planning. Q told us to read between lines. Mueller/Rosenstein blockade about to end. Whitaker was put in place to handle the removal of this RR mueller blockade. Timing is right on target. Qanon was silent past couple weeks to allow events to catch up to timeline; also, keep in mind that Huber investigation is vast and spans 50 states and involves 470+ lawyers and investigators. @potus and Qanon timeframe likely revolves around Huber’s investigation and prosecution. “Holds” must be built into timeline as NASA does with shuttle launch. AAG Whitaker removed Rosenstein (or is about to remove him) from Mueller oversight meaning AG now oversees Mueller. He also removed Ohr and numbers 1-4 in power behind Ohr at DOJ. Next step: Barr becomes new AG after blockades removed and bad actors cleaned out from DOJ. Both Barr and Whit review Rosenstein notes regarding why he would not declassify FISA and OIG report. Barr will then pull the responsibility of reviewing the FISA and reports from OIG based on @potus order to declass. Wray capable of ensuring there is no classified material being disclosed that would harm US operations or sources. #QAnon gives us the countdown markers for the next 90 days. Whitaker’s acting AG role was to clean house at DOJ & remove the Mueller blockade, including RRosenstein, Ohr, & “1-4″(?). Barr & Whitaker onto RR’s excuses to stall DECLASsification. Wray capable of determining. Once Barr’s installed, he’ll (w/ Whitaker) review [RR]’s notes on his reservations to DECLAS due to sources & methods + (irreparable harm) to FORN CLAS & pull the DECLAS review assignment from OIG citing that a POTUS EO doesn’t require IG oversight of ops integrity. Barr will execute our President’s order to DECLASsify + provide members of House committee the long-requested supplemental documentation in classified setting [the SC “scope memo” + the dox CLASsification] as required by US Law. Whitaker is slated to remain on DOJ senior staff, and, Barr meeting Huber & OIG, then, the OIG report, [spill in +30]. But, the House D’s threaten to subpoena Barr/Whitaker re: the DECLAS, SC report, Huber, etc…. House D’s’ll use subpoenas to stretch over 3 acts. The North Korea de-nuke plans to progress to lifting sanctions for aid. UK and Australia to shift narrative away from #FiveEyes spying on POTUS in our country by using the “hops” from peripheral figures concentrically to bullseye our President as Adm Rogers revealed. Dem’s will push their sky is falling narrative to scare and attempt to control the public through the media, and project their treasonous activities onto our POTUS. But, the public are awakening, and narrative damage control is in place. Everybody knows that something can’t be done, and then somebody turns up, and he doesn’t know it can’t be done, and he does it. This entry was posted in Uncategorized and tagged Disclsure News Italia, Feb. 10, love, QAnon. Bookmark the permalink.